Your garden marquee will provide a stunning backdrop to the natural beauty of your garden. Suspending fairy lights or rope lights from the ceiling. Set off the colours of your garden to co-ordinate with the carpet colour, or even the chair bows and sashes. Show off your grassed lawn with no internal flooring. Contrast floral displays against the soft effect given by marquee lining hire. 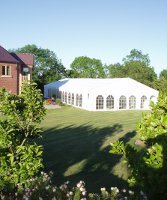 Get Your Quote for more information and prices of your garden marquee hire. Have your garden marquee tailored to your grounds. The ideal size and exact location to position your marquee. Where and how to incorporate catering areas into marquee using false walls. The best position to place window and plain walls to take advantage of scenic views. How you can quickly open and close panels depending on the weather. If you already know how many guests are attending your party or your ground floor dimensions, then view our marquee size guide to work out what size garden marquee will suit your event. Know what size structure you want? Then try out our FREE Marquee planner which allows you to design your interior layout. Your garden marquee has none of the restrictions of a traditional venue. Choose your own type and style of caterers which can work out to be more cost effective. Use your own refreshments avoiding expensive corkage charges. Run the party for as long as you want (but let your neighbours know beforehand or better still invite them). If you would like to know the cost of hiring a garden marquee for your event Get Your Quote Here. Tip: If you’re getting married try out our FREE wedding budget planner to manage your costs.